2/12/2015. 5 miles, Cat 3. A lovely sunny winter’s day after all the recent wind and rain. Day 2 and the weather was good. Fantastic oranges & reds on the trees through the forest. Some fairly steep hills kept us on our toes! It was turning chilly as we headed back. Di arranged for a 'hunt the way off the forest' at the end as we somehow missed the path to the car park and couldn't find a way round a boundary ditch! Finally we made it & washed our scooters off in a nature built facility! Shirl. 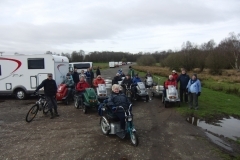 An intrepid group of DRer's set off from Lymington on a circular route, battered by rain & cold! Absolutely stonking views of the marina, estuary and IOW ferry made the poor weather bearable. 2 beautiful artists studios capable of being turned to any direction were seen on the seashore. Luckily by lunchtime the weather cheered up & we able to fully appreciate the autumn colours on the trees as we headed inland. A lovely interesting walk! Shirl. The day dawned misty and cold but the forecast said it would improve and it did. Fourteen members (and two dogs) enjoyed the lovely views from Bredon Hill across the Severn Valley, Vale of Evesham and the Cotswolds in the autumn sunshine. Thanks Andy. In the morning we climbed to and circled Stand Wood passing some of the wonderful follies and lakes. In the afternoon we rambled over the open grassland by the river. This is an out-and-back ramble from Millers Dale to Monsal Head. The track is well compacted and almost flat. Unlike previous visits here, we now benefit from two newly restored tunnels. Litton Tunnel and Cressbrook tunnels are each about 400 yards long. However, they are well lit with tarmac surface. Our lunch stop was on the Monsal Head Viaduct which gave views down to the River Wye in Monsal Dale below. From Hartington Station we headed south on the well compacted surface of the Tissington Trail to Biggin where we use a footpath along a minor road to reach and cross the A515. We then cut across to the High Peak trail on a typical farm track which was a bit muddy making the ramble Cat 3. Now heading north on the High Peak Trail, we reached our lunch stop at Friden before continuing to the junction with the Tissington Trail and our return to Hartington Station. Nice and easy – except for the mud! Oh - and the distance. 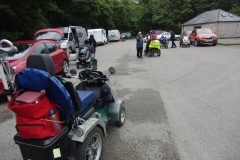 From Hulme End visitor centre, we followed the delightful Manifold Valley and through the Swainsley tunnel to the National Trust café at Wettonmill for our lunch stop. Returning on the gated road on the other side of the river gave us a different view of the area. 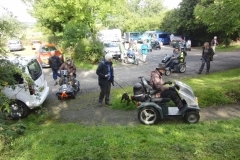 A rear wheel came off one of the Trampers but it was soon put back on. Somehow the fixing nut had worked loose. "Beautiful weather, far reaching views and good company. What more do you need to make a late summer day in the Cotswolds perfect ... Sheep of course! Jak specialises in painting animal portraits, and there were some real beauties for her to photograph. Barney, Jo's dog, obliged by not rounding them up, but faced down a couple of snappy terriers instead. Thanks to Sue, Andy, Jak and Jo for a lovely pastoral day out." Eileen S.
29/8/2015. 3 miles, Cat 3. DR Member David & Angela Wynn officially opened the new Easy Access Path which, by their permission, passes through their grounds at Fladbury. 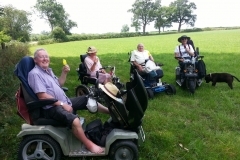 13 Disabled Ramblers plus about 30 villagers enjoyed the three mile ramble along the banks of the River Avon before enjoying drinks and cake at the Chequers Inn. 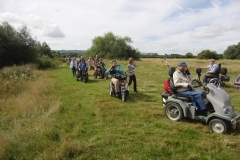 Many thanks to Amanda and her team at Worcestershire CC for their work on making the path accessible. 18/8/2015. 6 Miles, Cat 3+ at least. Finding a disabled-friendly toilet at the start was a good omen and so was the sunshine. A deceptively easy start up and out of the village soon led to tracks of increasing steepness and roughness with some challenging deep cross-ruts. However, all made it to the top without mishap – except for some of the Supersports cutting out on the steeper bits. 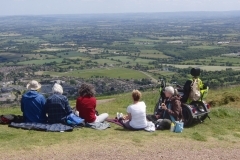 Lunch was taken in the rings of the ancient hill-fort overlooking the Rivers Avon and Severn with views across to the Malvern Hills and beyond. Our return was much easier; a more gentle slope on a good surface. Many thanks to Andy who was running his first ramble for us – several more are promised! Monday 10th August 2015. 6 miles, Cat 2. 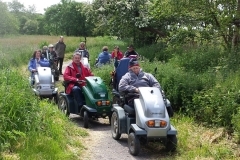 A chance for some local people to try out loan Trampers accompanied by some of our members. HORSHAM RIVERSIDE WALK - 25TH JULY 2015. This is an event held by Horsham Town Community Partnership, a group to try to make interesting things happen in and around Horsham, Bob and I attended last year for the inaugural walk and this year we were very pleased that 7 DR's were able to come and join us. It is a 13.5 mile trip for us people on scooters as we have to take certain diversions to avoid steps and too narrow bridges etc. and so it makes it a bit longer than the official 12.5 mile route. It is a fairly flat walk through suburbia, parks, riverside paths, fields, woods, nature reserve, farmland - so is very varied but very pleasant and challenging from the distance point of view. I am pleased to say we all made it! Apart from ourselves there were about 100 walkers so it made for a friendly gathering. During the walk we had to cross a very busy dual carriageway and the local police controlled the traffic with a rolling road block to enable us to cross safely, which all added to the excitement. 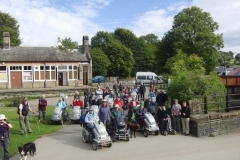 Lots of interest in our scooters and many couldn't believe what we do in Disabled Ramblers. Thanks to all DR's who came - and here's to next year! Val & Bob. 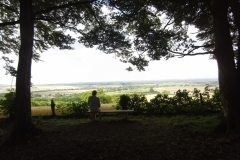 HIGHDOWN HILL, WORTHING, WEST SUSSEX – 15TH July 2015 The day dawned with greyness and drizzle, but when we arrived at 10.00am it magically cleared up and in the end we had the perfect day for this long awaited ramble. 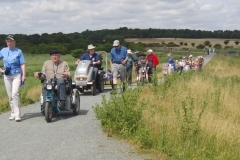 It was one we had wanted to do for ages and is actually the first ramble led by our Regional Rep for West Sussex, Bob McLellan. 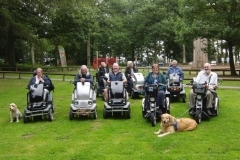 We had 9 scooters and were pleased to welcome two new members, Julie and Ian Preddy. Also, it was great to have Chris Christou along (nice photo of him with a stripey umbrella!). From the top of Highdown Hill on a clear day you can see the coastline stretching away as far as Beachy Head in the east and Isle of Wight in the west. 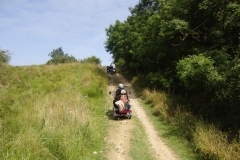 On our journey over the hill there were some rutted paths and steep inclines which gave us some fun, but everyone coped very well, albeit slowly sometimes. We went along a bridleway which follows the base of the hill to Angmering village. We had an impromptu reccy of a bridlepath we had found earlier in the year, but at that time we had to turn back because it was so muddy – but our team on the 15th were keen to explore it, we could only get three quarters of the way down it due to camber and deep muddy ruts but we all enjoyed it, and it gives a sense of achievement. On our return to the car park we went into the beautiful Highdown Gardens which are run by the Borough Council and are really lovely, then we went on into the Highdown Cafe for a cream tea, and would you believe it – the minute we sat down it started to rain but the staff put the table umbrellas up and we were still able to enjoy our scones and tea. A really good day, and a lot of fun. 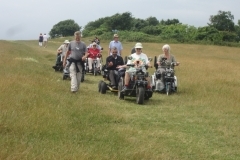 Everyone mucked in and helped each other, as you can see from the photos we had a battery failure and needed help with towing – good old Linda!!! Thanks to all for coming and to Jo Hooper of Highdown Gardens for all her help with unlocking the gate so that we could access the Hill. Bob McLellan & Val R.
A lovely nine mile, Cat 3, circuit in the Cotswolds with steep climbs from Winchcombe. 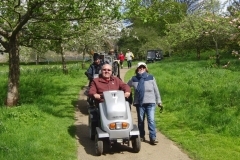 Thanks to Eileen S and to Paul, a footpath warden with the Cotswold AONB. 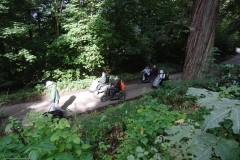 Starting from Lynford Stag Picnic Area the ramble followed wide grassy forest tracks to Lynford Hall where we visited a beautiful arboretum for coffee before continuing to the reclaimed gravel pits for lunch. We returned alongside two attractive lakes before re-joining the outward route back to the start. Thanks to Tony & Dorothy. 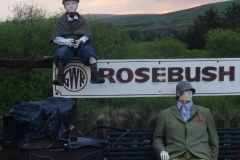 From the campsite we climbed gently, passing the farm where Captain Cook grew up then on to pass by the magnificent Roseberry Topping which some of our walkers climbed. Down into Guisborough Forest for lunch then returned. We climbed steadily through the picturesque forestry tracks to High Cliff Nab for lunch with breath-taking views returning through Hutton Village. Dodd Wood, near Whinlatter Forest, towers high above Bassenthwaite Lake providing unrivalled views of Derwentwater to the south and to the hills of Dumfries and Galloway, especially from the summit. 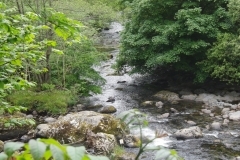 Dodd Wood offers attractive and varied way-marked trails from a central car park with picnic areas, the Old Sawmill tearoom and toilets. 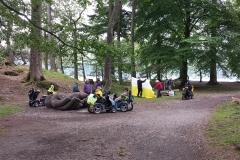 Dodd Wood is also the location for the open-air view point for the Bassenthwaite Ospreys. Whinlatter is England's only true mountain forest. Rising 1000ft above sea level, the forest and visitor centre provides a whole range of outdoor activities. The forest is home to Roe deer, badger, fox, Crossbills and Siskin whilst the fells are the hunting ground for Buzzard and Merlin. Whinlatter is a Red Squirrel reserve where Red Squirrels are actively being protected and supported. Derwent Water has been the subject and backdrop of many films. Arthur Ransome famously wrote Swallows and Amazons based on this lake. Where children spend the school holiday in boats playing pirates and sailing to the small islands. Our walk took us along the opposite shore with Catbells rising above us. the Swinside Inn in Newlands Valley kindly let us use their car park. This a very pretty route is listed as a 'Miles without Stiles' walk we added a trip to Nichol End cafe for tea and giant scones. Maryport is a very old small town with a picturesque harbour looking over the Solway Firth to Scotland. The beaches are a mixture of rock pools, pebbles and sand. 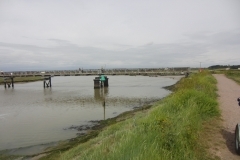 On a grey June morning with cold wind for company, we followed Hadrian’s cycleway along Maryport Promenade. 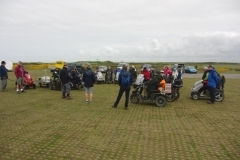 After a welcome stop at the golf club clubhouse for coffee (and bacon butty for some) we continued along the path close to the shore north towards Allonby until we reached Crosscanonby Carr Nature Reserve where we had lunch. A mile of “quiet” road took us onto the golf course where bemused golfers watched as 20 scooters plus 19 walkers ambled slowly across the fairways. The wind had dropped by now and the sun made the occasional appearance as we again stopped at the golf club clubhouse with some partaking of liquid a little stronger then the morning’s tea. Thanks to Eileen for a splendid start to our Cumbrian adventures. A long climb in the morning on forest tracks to a high point of 1500ft in the Preseli Hills revealed wonderful views across Pembrokeshire. Returning by a different route was mostly downhill. Much of the forest had been cleared allowing spectacular panoramic views throughout the day. 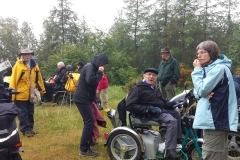 Starting at the 19th Century Water Mill we followed a track through woodland and open farmland to the gardens of Slebech House where we had superb views of the Cleddau Estuary. After lunch we returned to Blackpool Mill by the same route. 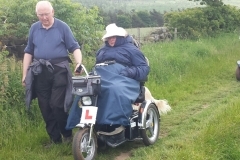 Lancashire – Wyre Tramper Treks Garstang Walking Festival included two Tramper Treks. The first on Thursday 14th May billed as “Lapwings & Hares” was more for the birds – strong winds had the hares hiding in the shelter of a stone wall up on Peacock Hill above Cobble Hey Farm. The lapwings had curlews and redshanks to play with so it was a great day for the ornithologists and for the amateurs like myself because we had Gavin from the RSPB on hand to explain what was happening and why these fields were such good habitat for the birds. Back at the farm we warmed up with a hearty lunch in the café at Cobble Hey. 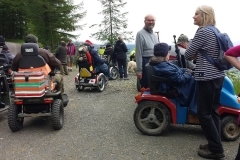 Saturday 16th “Scorton Tramper Trek Challenge” had an added dimension when one of the Trampers developed an electrical fault and had to pushed and pulled up Nicky Nook Fell. 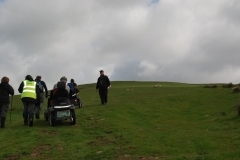 We started at Wyresdale Hall Park on tarmacked lanes before the challenge of getting the Trampers up a steep grassy slope to the Pepper Pot monument and then on through a stream before making the trig point. The photos tell the tale of the lads who had just came out for a walk and ended up with a ‘workout’ many thanks to all who helped get Owen to the top. 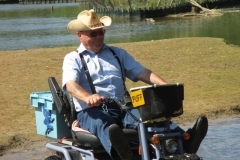 Ranger Duncan went back to base to collect a replacement Tramper while we soldiered on. Thanks to a phone call to John Cuthbertson we were able to get the ‘brake’ off the troubled Tramper. That made life easier! Well done to Duncan for getting the 4x4 truck and large trailer along a narrow winding wooded lane to retrieve the faulty Tramper. Back on the road and on to the cake and tea in Wyresdale Applestore café. At least the weather kept fine. A really great couple of days. E.T. 8 miles Cat 3. Pembrokeshire is a lovely County, nowhere more so than the Pembrokeshire Coastal National Park. This ramble took us along the seaward edge of Castlemartin Range East which is only open to the public when not needed by the MOD – that’s most weekends, holidays and some evenings. The weather was kind to us, giving great views all along the coast. As the world’s foremost limestone sea climbing cliffs, there were plenty of rock climbers to watch and admire. It was hard to stop Terry from trying to join them! Unfortunately one climber took a bit of a tumble and was helicoptered off to hospital during our lunch stop. We were assured he was not badly injured. The descent down the steep steps to St Govern’s Chapel was not possible for most of our members; the photos here might give you a bit of an idea what it was like. Many thanks to Tony & Dorothy for organising and leading. 7 miles Cat 3. The views from the cliffs above Castlemartin Range West are normally only seen by fishermen and rock climbers who have had a special briefing to enter the live firing side of the Castlemartin Ranges. 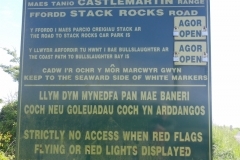 So we were quite privileged to be allowed entry – although disclaimers had to be signed and we had to stay in a column with a guide from Pembrokeshire Coast National Park to the front and rear. Although the strong wind made for a cold day it was sunny the great views made up for this together with the wonderful wild flowers and large numbers of birds to identify. 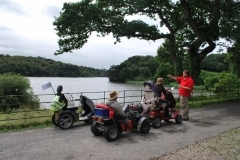 Many thanks to Tony & Dorothy and to the Rangers from Pembrokeshire Coast National Park. RICHMOND PARK - 13th MAY 2015 This was an eagerly awaited event as there haven't been many rambles in the London area for some time and it was great to be able to welcome 11 scooters and 5 or 6 walkers on such a lovely sunny day. Among them were some long-standing DR members such as - Rosie & John, Eileen & Dave, Kim & Keith, Brenda & Keith, Roly & Margaret, Christine & Geoff. 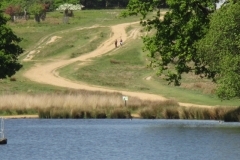 Richmond Park is some 2,500 acres and is 10 miles from London, and is the largest and wildest of the Royal Parks, and is internationally known for its ancient oak trees. It was originally used for hunting by the Kings & Queens but nowadays it is a refuge from the hustle and bustle of daily life for many of us. We set off round the edge of the park towards Sheen Gate, past Adam's pond where Dave's little dog had great fun having a swim, then on towards Two Storm Wood (don't know why it has this name!). A little further on we stopped for coffee with a super view of the London skyline including the Shard, London Eye and Gherkin. We then progressed down through the Pen Ponds where there was a great variety of water fowl - ducks and geese including two Canada geese with their tiny goslings. Considering the proximity to the Capital there is a surprising amount of wildlife in the Park that we saw on the day, including green woodpeckers, parakeets, herons, three lovely carthorses cantering in their enclosure, and a large herd of red deer which we saw en route to Pen Ponds, horse riders, cyclists (not really wildlife - but interesting just the same!). It really is a unique place.This was only a little of the wildlife that crossed our path, it is a very diverse area for beetles and many other species of birds. After coffee we continued on our way to the Isabella Plantation, which was planted after WW11, where we stopped for lunch before a tour of the plantation and were joined here by Brenda & Keith. The azaleas and rhodendrons were at their peak and were truly spectacular as you can see from the photos, and we also went through a lovely woodland area where there were bluebells as well, so there was something for everyone in the way of seasonal flowers. 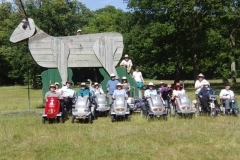 We attracted many comments from the other visitors on our way - as we always do - I guess we are quite an unusual sight in the middle of Richmond Park! It was then onwards across the Park to Pembroke Lodge for our cream tea at about 4pm. Bit of a panic as they had mislaid our booking, and also a prominent politician was arriving shortly and the terrace had to be cleared for his party, however, they made us very welcome on a little side lawn with picnic benches and brought out two trolleys laden with tea, coffee, copious amounts of cream and jam, scones and sandwiches - so we were more than happy!!! We then made the homeward journey back to Roehampton Gate, we arrived there at about 6pm so it had been a long day but it was well worth it. We had a super time and many thanks to all who came and especially to Nomi for leading it so well. Please watch this space as we hope to put more on in the London area - plans are afoot! Anyone who has any ideas or would like to go to a certain place please let me or Nomi know and we will see what can be done. best regards, Val. SOUTHERN REGIONAL RAMBLES. PONDHEAD BLUEBELL RAMBLE, LYNDHURST, NEW FOREST, HAMPSHIRE. It’s always very difficult to judge just when the bluebells are at their best – BUT WE HIT THE JACKPOT!!! They were just perfect, and were interspersed with pretty little white stitchwort flowers, blue spikes of bugle (ajuga), little yellow creeping flowers and signs of masses of foxgloves starting into growth to be visited again in about a month’s time. 8 of us turned up out of an expected 10, but 2 illnesses prevented the original number, we also had a very welcome 3 walkers for support – among them my own daughter Wendy and her husband, Steve. We had a special visit from Wendy & Rita from near Cardiff in Wales. 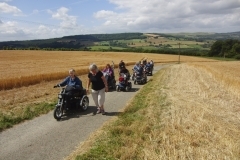 These two ladies had gone to the trouble of hiring a transit van for their scooters especially for the ramble, they loaded and unloaded the scooters and then coped with all the lumps and bumps they came across on the ramble with great glee – very inspirational! It shows that when you want to do something badly enough you will go to great lengths to achieve it. 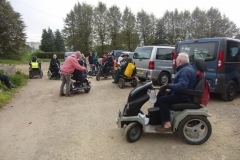 This was their first DR ramble although they had tried to get to the DR ramble last October but due to traffic were held up and couldn’t make it in the end, so were doubly determined to get there this time. We were met by Derek, a Volunteer who has been helping to coppice the wood in the traditional way and to bring the woodland back to what is was many hundreds of years ago, and he gave us a talk on their work and showed us their state of the art charcoal burner, which cost a huge £15,000 the cost of which was met by a grant they were able to get. This produces charcoal of the highest quality – 96% carbon – they then sell this to local hotels, campers, restaurants etc. Also, to test it they have frequent barbecues in the beautiful wood they work in, they feel that is the least they can do!! The coppiced wood is sold for pea and bean sticks, to make layered fencing and of course, to make the charcoal. They also produce charcoal sticks for artists. Derek gave us a very interesting talk and in the photos you will see a couple of the rustic stools they make for themselves to sit on in the woodland. The bluebells were lovely, and add to all this the birds twittering all around and you begin to conjure up the picture. Many trees have been planted to encourage different varieties of birds to come back into the wood to eat the caterpillars, grubs and insects which make the trees their home, and the undergrowth has been cut back to encourage wild flower growth in order to attract butterflies and other insects to re-inhabit the area. We then proceeded through the lovely fresh green forest until our lunch break on the banks of the delightful meandering stream you will see in the photos, another magical spot with just the birdsong for company (+ 8 ramblers!). 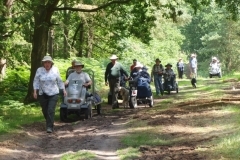 From there we came out of the woodland onto a sandy track known as The Ridge which leads back to Lyndhurst, this can be slightly tricky at times – but we all managed it with great aplomb! We then had to negotiate 2 sets of traffic lights to get back to the car park in the middle of Lyndhurst – a lovely little town in the New Forest, but it gets really busy and it is a shock to come out of the tranquillity of the forest and back to civilisation. A really great day.....many thanks to all who came to share it with us. Regards, Val & Bob. 6 miles, Cat 3. 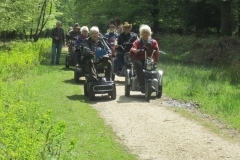 What a turnout; 15 scooters on a Regional Ramble! Although showery to start, the sun joined us as we followed lanes – and were followed by a very large tractor. 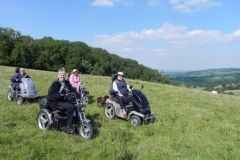 Soon we were on the Cotswold Way, pulling off it for a tea break with views over Bredon Hill and the Malvern Hills. Then to the much anticipated decent into Lavington. Steep and narrow with rocky drops this had caused some ‘fun’ during the reccie last year. 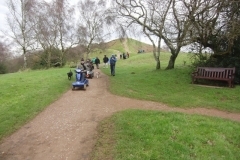 Thanks to the work of the Voluntary Cotswold Footpath Wardens the most difficult sections had been removed. However, Linda decided to go off-piste and managed to meet up with the ground. Lunch on a delightful meadow outside the pretty village of Buckland was followed by a long steep climb which taxed one scooter to the limit. Thankfully Eileen and then Nomi were able to give assistance with a tow. After enjoying the view across to Snowshill we returned to the Manor to enjoy a National Trust cup of tea – and cake. Thanks Eileen and Wardens Paul & Mary for a wonderful day out. 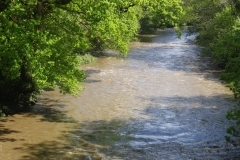 One of the largest urban parks in Europe, Sutton Park is an oasis of tranquillity in the West Midlands conurbation. Our 6 mile circuit was Cat 3 but there are many paths suitable for smaller scooters. A great time was had splashing through the fords and climbing the muddy banks through the woods before lunch near the Bistro. Then to the western side of the park with wide open views over the heathland with skylarks singing. Many thanks to local member Jane for showing us the route. Cat 2+ Ford! 6 miles. From Rifle Range Corner car park, down Pepper Slade and through the ford where two scooters needed a push on the loose gravel bottom. Up to the Glacial Bolder for coffee. Then along the old railway before turning sharp right to the Stepping Stones for lunch with. Another opportunity to play in a ford. Up the Sher Brook Valley, across the ford again and back up Pepper Slade. Back at the cars and packed away just before heavy rain started. A nice start to the season. Held at Kingsbury Outdoor Education Centre, our 2015 AGM included outdoor activities – abseiling and archery.